Q: The Penguins entered the league in 1967. A young French Canadian star named Michel Briere was emerging as the first great Penguins player, but was tragically killed in a car accident after only one season. How much did this set back the organization? A: Short-term, his loss had a devastating effect on the team. While Briere wasn’t in the class of Mario Lemieux (few players are), most observers felt he would’ve been an outstanding player for years to come. In addition to his skillful play, teammates said he was a real competitor who hated to lose. Long-term, it’s a little harder to say. His loss prompted the team to trade for Syl Apps, who became the Pens’ first superstar. Still, it would’ve been interesting to see a team with Apps, Briere…and Pierre Larouche down the middle. Q: In the pre-Lemieux era, who was the best Penguin? Apps? Kehoe? Briere? A: The three players you mentioned would rank very high on the list. Apps was a terrific playmaker who turned everyone he skated with into a scoring threat. Kehoe was a wonderfully consistent goal scorer despite playing on some really bad teams. And there’s no telling how good Briere might have been. But in my opinion, Jean Pronovost was the best. Not only was “Prony” a dangerous scorer (he reached the 40-goal mark four times) but he was an excellent two-way player. Q: How does Mario Lemieux rank compared to other Pittsburgh sporting heroes? A: With all due respect to Roberto Clemente, Honus Wagner, Willie Stargell and Steelers legends such as “Mean” Joe Greene, I think Mario ranks head and shoulders above the rest. He saved hockey in Pittsburgh, not once but twice. The influence he’s had on hockey in the city almost defies description. Prior to his arrival, there were maybe a handful of local rinks and a few club hockey teams. After he arrived, everyone was wearing No. 66 jerseys. Kids suddenly wanted to play hockey. Now it seems every high school has a team. And you have Pittsburghers like Ryan Malone, Dylan Reese and Matt Bartkowski skating in the NHL. That’s all due to Mario. Q: Who is the most underrated player in Penguins history? A: It’s hard to imagine a guy who scored 1,798 points could be considered underrated, but I’d have to say Ron Francis. While players like Lemieux, Jaromir Jagr and Kevin Stevens grabbed most of the headlines--and deservedly so--Francis quietly went about his business. He was a marvelous two-player who did everything a team could ask of him. He scored clutch goals, won key faceoffs and backchecked with the diligence of a coal miner. More than one teammate credited him for being the team’s “glue” guy--the one who held everything together. Larry Murphy, Dave Burrows and Ron Schock deserve honorable mention in the underrated category. Q: How about Paul Coffey? How important was his acquisition? A: The acquisition of Coffey was huge. Despite Lemieux’s considerable presence, the Penguins still had a decidedly minor-league feel. Mario was skating with guys like washed-up former stars Wilf Paiement, Charlie Simmer and career-minor leaguer Jock Callander. In one fell swoop Penguins GM Eddie Johnston added a bona fide superstar to help Mario, while finally giving the team a big-league identity--not to mention another gate attraction. It sowed the seeds for the Stanley Cups in the early 1990s. Q: How close did the Penguins really come to leaving Pittsburgh? A: It’s hard to know for sure. But my guess is, pretty close. In 1971, when Tad Potter and his partners bought the team, the other competing groups were from out of town. Al Savill, who doesn’t get the credit he deserves for saving the team in 1975, had ties to Columbus but kept the team in Pittsburgh long enough for his friend, Edward DeBartolo, Sr., to take over. “Mr. D” was the first Penguins’ owner who had the determination and financial wherewithal to see the team through tough times. However, there were rumors he would move the Pens to Hamilton or Saskatoon--until Mario arrived on the scene. When the team declared bankruptcy in 1998, Roger Marino threatened to move it to Kansas City. With Marino it was hard to determine if he was sincere or if it was just a ploy to get extra public funding. Lemieux, too, put the Pens on the auction block, although he later admitted he never intended to move the team. A: In fairness to the other guys, I mostly watched Gretzky when he played against the Penguins. And I’ve only seen Bobby Orr and Gordie Howe in grainy old film clips. A lot of knowledgeable hockey people claim that Orr was the finest player they ever saw. But to me, Mario is the greatest. He didn’t have the luxury of being surrounded by Hall of Fame talent early in his career, the way Gretzky and Orr did. Yet he did things on the ice--breathtaking things--that I’ve never seen anyone else come close to doing. In 1988-89--the year before he hurt his back--he was the most dominant player I’ve ever seen. Mario was literally a threat to score every time he stepped onto the ice. Q: Is there a chance Sidney Crosby could one day surpass Mario Lemieux as the greatest Pittsburgh Penguin of all time? A: That’s a great question. In terms of sheer numbers, I don’t know if any Penguin will ever surpass Mario. But Crosby is such an incredible all-around player. What makes him so special is his work ethic. I don’t think I’ve ever seen Sid take a shift off. I have to tread lightly here, but as extraordinary as Mario was, he was known to “pace” himself from time to time. What really stands about Sid is his desire to be a complete player. Primarily a playmaker when he first came up, he’s emerged as a lethal goal scorer. And he worked hard to become a top faceoff man. I’ve never seen a superstar so committed to improving his game. Q: Your book Total Penguins, is incredibly thorough at over 700 pages of stories, profiles, memories and stats. What gave you the idea to compile such a definitive resource? A: All the credit goes to Tom Bast at Triumph Books. I had written a much smaller, 200-page version of the book that I was trying to get published. It was Tom’s idea to go whole-hog and do “Total Penguins.” I just about choked when he told me what he wanted--a 700-page book! But I’m quite pleased with the results. Q: The research put into the book is obviously exhaustive, something every Penguins fan must have and would fully appreciate. Tell our readers where they can buy the book. 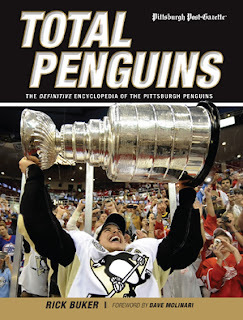 A: “Total Penguins” can be purchased at major booksellers such Barnes and Noble and Borders. If you don’t find it in the bookstore, it also can be purchased online through sites such as triumphbooks.com, amazon.com, barnesandnoble.com and borders.com. editions or as downloadable content? A: There was some material that didn’t make the cut. It will be included in my second book, “100 Things Penguins Fans Should Know and Do Before They Die,” which is slated to be released by Triumph in the fall of 2011.